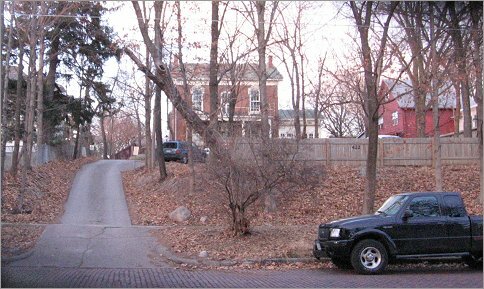 The Gaslight Village is a unique historic Iowa City landmark situated on nearly two acres of hilly, wooded grounds on Brown Street, where it stands as an integral part of the Historical North Side. Many unique apartments and rooms can be found in the four buildings which constitute the Village. Two of the buildings are Victorian structures. The oldest of the two (circa 1860) is the Charles Berryhill Mansion (shown above), which is listed on the National Registry of Historical Places. The remaining two buildings are rustic in character and appearance, owing much of their inspiration to the creative architecture being developed in northern California during the 1940's. The Gaslight Village was founded in the early 1950's by Henry Black, an eccentric visionary. Henry sought to create a haven and sanctuary for writers and artists. Indeed, the Village counts well-known writers among its former residents and Kurt Vonnegut lived one door east, while the actor Gene Wilder lived one door west (former residents have claimed that Philip Roth and John Cheever lived at the Village while at the Workshop). Cherry Muhanji, Chris Offut, Anthony Swofford, and Jessica Anthony, were recent Village residents. The goal of the Village is to offer a unique living experience at a reasonable rent, in a quiet, secluded environment. About half of the Village residents are either graduate students or college graduates. The Village is built on a hill with many trees and abuts a wooded ravine. The units typically have wood floors, high ceilings and large windows; cats are welcome; there are laundry facilities and free, off-street parking for residents. A scant four or five blocks from downtown, the Gaslight Village offers a unique housing option for those seeking a quiet, serene environment. The ambiance of the Village is distinctive and, therefore, may not appeal to everyone. We suggest that you stop by and look the place over, on foot, on your own, and at your leisure, before proceeding further. A brief visit should give you the flavor of the Village. 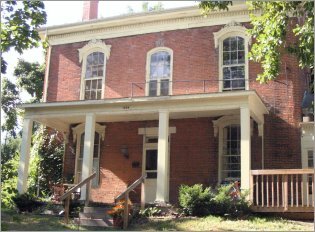 The property is located at 422 Brown Street, near the corner of Gilbert and Brown. If you do stop by, bear in mind that the Village extends north up and beyond the hill, past the Berryhill house, to where the two rustic buildings are located. Click here for more information about rentals, and to view a gallery of images of the Gaslight Village.